Ah, yes, setting up for success!! I think out of at least a hundred positive reinforcement training classes and workshops that I have attended over the years, 90% of them were just teaching creative ways to set trainer and trainee up for success. I have been surprised so many times when even celebrity positive reinforcement trainers have admitted to mistakenly creating their own failures by moving too quickly through training something, teaching a complex skill out of sequence or rewarding the wrong behavior. There is no shame in admitting a failure and picking up the pieces to do better as many times as necessary to find success. In fact, sometimes redefining success can be part of eventually reaching the goal. I was so glad to read this. We had company for Christmas and some of them didn't understand why I kept the dogs in another room (we just had a gate up so people could still say hello, but Luke could stay back where he was comfortable). We've been working with Luke and strangers but we have a long ways to go, so to me just keeping him separate was the best thing to do. Trying to work with him and a large group of people would have been counter productive. I know we need to take baby steps and we're doing our best to do that now. Management is so important! Sometimes I feel like all I can do is manage Leo by only walking him at times we aren't likely to see joggers or bikes. I carrying string cheese in my hand and if we happen to see one of those things, I feed it to him, saying "cheesy cheesy." He's been doing so well, I wonder if I'm actually teaching a new behavior! I totally agree!! Management can make a break a training program! I use it all the time! When we go out the girls are left in the bedroom so they can't get into stuff. I also feel like setting them up for success is really important and not allowing them to practice the behaviors by using management is very helpful, too. Great post. Some people only do training and forget about management. But you need to handle situations while you're training, as you say, to set your dog up for success. And other people only do management and don't address the behaviors through training. Together, they're an amazing combination. 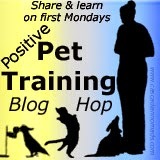 Great idea to start this hop during Train Your Dog Month. I've added it to my calendar to check out next month. Nothing like setting a dog for success. Asking too much when the dog isn't able to perform it is what breaks the best training plans. Very true, redirect things in a positive way, or remove the problem if possible. Mom still loses it and has to yell and have a fit now and then, but it only makes her feel better, doesn't do a thing for us when that happens. I like the film on the window idea. I never would have thought of that! One of my dogs is slightly reactive and that is challenging enough. I can't imagine if he was really reactive. Elli developed a nasty habit in 2014: counter surfing. She even figured out that if I am distracted or my boyfriend (who does no training with either of the dogs, but rather reaps the benefits and follows the rules I set with them) is the only one in the house, she can run to the counter and steal any old food item, including entire sticks of butter, waffles from breakfast, or a bag of apples. As much as I hate doing dishes, management has done wonders for her behavior. She can hop up on the counter as much as she wants, but she doesn't get rewarded for it anymore. And I don't have to yell at her anymore. My sensitive little girl just couldn't handle that nonsense. I love this post! I too had a problem with Haley getting into the trash can and I still move the trash can around the corner outside of her reach when I leave the house. It's an easy thing to do to manage her scavenger instinct instead of being frustrated about her not behaving while I'm gone. It only takes a second to do something that sets her up for success! Mr. N went to play with a new friend and they decided to play I can bark louder than you. Rather than telling them to shush repeatedly, we redirected them with nosework gams. Much easier on our ears! Davinia was always slightly reactive. The more exercise she got the happier she was in general just like any dog. Couple exercise and fresh air and friends of all ages and Davinia was a very happy girl when we lived in Hong Kong. Even dogs that would normally set off her re-activeness she wanted to befriends with. A lot of things changed in our lives and I just cannot get her back to her happy place. That is not to say she isn't happy she just has very little desire to be Social and put up with anything from other dogs if I am the one holding the leash. Setting up for success is so crucial. My dog loves indoor brain games and picks up on them quicker than anticipated. I really believe it is due to working with him, doing things physically and mentally that make him happy and continue to thrive. Great examples of management. I could not agree more about how important it is. My dog, Shyla, is also "reactive" but in a different way. She has fearful meltdowns that lead her to be immobilized with terror. I have to constantly scan the area around us when we're in town to move her out of the path of the few remaining things that can cause a meltdown. That's another form of "management", I think! I never understand people who complain about their dogs getting into the garbage but then leave it out, easily available to them! My Labs will never be able to handle that without dumping the garbage can!!!! Thanks for hosting this hop! The medium-sized dog I grew up with was horrible about getting into the trash. She would always steal things and eat them or chew them up. Then we would chase her around the house trying to get whatever she had.... My parents had a short little trash can in the kitchen that didn't have a lid. Sometime in the year after Brittany died and before my parents got Ginger, they also replaced the old trashcan with a tall, sturdy trash can that had a solid lid. Ginger has never once stolen anything from the trash! I think management is often a forgotten training tool and people turn to (ineffective) corrections and punishment, when a simple management solution could solve the problem. This was a wonderful post! Thank you for sharing!! Very good advice! 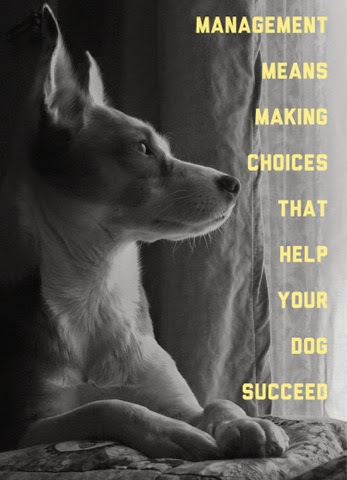 Setting your dog up for success and accepting responsibility for doing so yourself is much better than getting angry at your dog, making things worse. I love the frosted film on the front window idea - genius! A good reminder about how important an ounce of prevention can be. The more work we can do ahead of time the more work we save ourselves on the back end. Parents would do well to take this approach too. Set your dogs and children up for success! Less barking would definitely mean less stress. Thanks for this information. Management is definitely one of the most important words in our vocabulary. It's not always easy to stay a step ahead of Barley, but life is so much easier when I can spot dogs before she does and redirect her attention. I'm glad you found such a great solution with the window--I try to make sure that home is one place where Barley can be Barley without having to give her commands every time she moves. Nice and great blog! your blog content is all about being good enough to understand better. thanks for sharing this post.